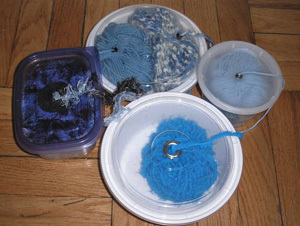 Keeping your yarn clean and traveling with it can be a hassle without a proper container or bag to put your work in. There are some clever containers that you can make at home by reusing / recycling materials. 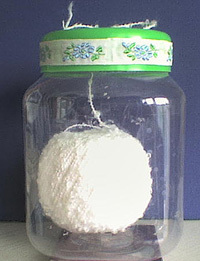 The basic idea is to use a container and poke a hole at the top so that your strand of yarn can go through it. You can use any container you like, such as an old storage container, food container, or small canister. If your container is big enough you can also store your hooks and pattern sheet in it too! These containers I found at instructables.com. They have a tutorial there for making these yarn containers as well. Looks like they just used good old food containers. This container I found at Drenka’s Blog. She used an old plastic container that used to hold spices and even decided to decorate the container with a ribbon. Do you have a yarn container idea you would like to share? This entry was posted on Saturday, October 10th, 2009 at 8:39 AM by Rachel Choi	and is filed under Tutorials and Help. You can follow any responses to this entry through the RSS 2.0 feed. You can leave a response, or trackback from your own site. Have u tried using paper boxes? I use any paper box that comes with a lid. Some gift boxes have a flap lid with hidden magnets. They are snugly shut but still loose enough for the yarn to come through. If they are oridinary boxes, then just cut/punch a hole in the side or or in the lid. Shoeboxes also make good containers, you just cant carry them around though. I dont use old plastic containers, i give them to charity. Great idea!! Seems easy enough except for the grommets. My old hands can’t find the strength to press hard enough to join the pieces. I, too, was looking for a way to keep my yarn clean while working with it, but found there were times when I wanted to put away a WIP in favor of another project. Unfortunately, when using containers like these where the yarn runs through a hole, I would either have to cut the yarn or put the WIP away with the container, making it un-useful for any other projects until that one was done. My solution? Zipper-style plastic bags. One can close them up to about 2 inches, leaving just enough room for the yarn to flow. Plus they can be used to store yarn while waiting to work with it. And they can be re-used over and over again. TRY THE ROUND BABY WIPE AND CLOREX CONTANER’S THEY ARE GREAT TO POKE A SKIN OF YARN DOWN IN. Those would work great until you came across one of the pet peeves – a knot in the yarn! If its a serious knot you’d have to cut the yarn and then you’d be stuck with another pet peeve – working in extra ends! I love the giant jars the pretzels come in they have at Costco. Here is a picture of my scrap in a pretzel container. 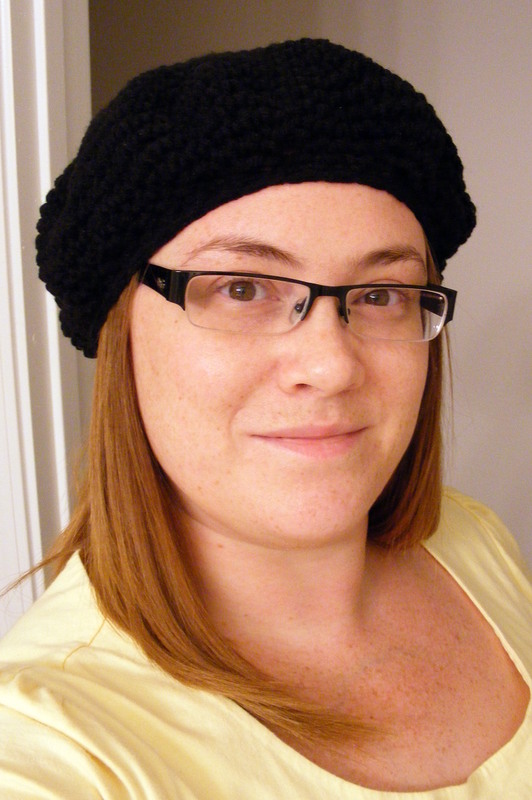 These are also ideal for those one-pound skeins of baby yarn that do not pull from the middle! Yes, snags can be a pain (which they are anyway!) but the yarn flows through this very smoothly when it’s not knotted. I also love the handle & I’ve seen 3 color options, light beige, dark brown, & pink. I like using the 2 liter soda bottles. Cut a “doorway”in the side with an exacto knife. Cut on three sides (leaving a doorway flap). 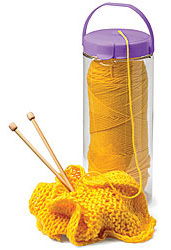 Put the skein of yarn in it, close the “door”, and run the yarn through the top lip of the bottle. Keeps it clean, and you can see the color of the yarn. You can also store the hook and pattern directions in it to keep them all together! Another good storage container is the shopping bags they sell at almost every store now! Some even have convenient pockets you can store your pattern and hooks in! I agree with Carol. I just finished a container of clorox wipes and realized that it would be the perfect size for yarn and the top that holds the next wipe in place is perfect for the yarn to slide through. Even if there is a knot then it can be slipped out and corrected then put right back in without cutting the yarn. I’ll have to take a picture and post it when I get home. It might make more sense if you were looking at it. 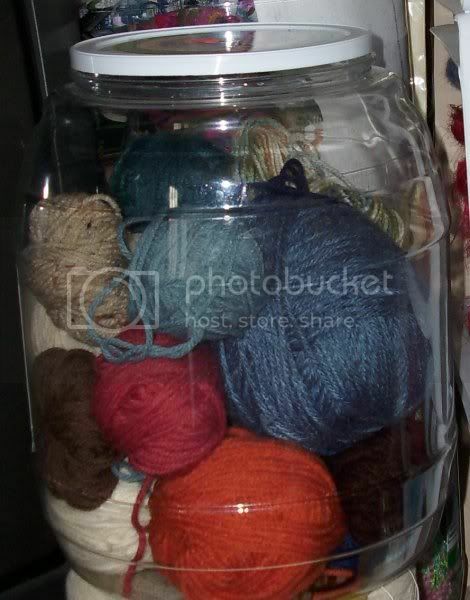 I have a used recycled glass jars (think of the kind from mayo or pickles) for yarn. I pushed a hole through the top of the lid with a screwdriver then used a grommet to cover the ragged edges. I use the plastic coffee containers. I put a hole at the side of the lid. I like to store the project inside with the yarn. But it still smells like coffee even with washing. Vanilla is supposed to get rid of strong smells, I believe. Will have to try. Any other suggestions? Lemon juice? I also use the plastic coffee containers. I especially like the coffee containers that have the built in handles. Keeps my yarn contained, off the floor and free from pet hair! I have a few containers which is useful when my project has different colors in it. ps – I haven’t had a problem with the yarn or projects smelling like coffee, but then again, I love coffee! for hand wound yarn i usually just set on the floor in a bowl and then sit on the couch. Linda – try putting your container in the freezer for a day or two. I know this works if your tupperware has an aroma you can’t get rid of – work a try. I find it interesting that having a yarn container seems to be such a big topic. I see suggestions on almost every knitting or crocheting site I go to. I’ve always just grabbed a plastic bag, the kind you get from wally world or any grocery store. Put the yarn in it and loosely tie the handles with the yarn and project sticking out. When I’m stopping for the moment I just unknot (this is why loosely) put my project in the bag along with any directions and knot it up again. I have had friends give me container after container and there is always a time that I can’t use the container. I can use this even if I started the project without a container handy. I have MANY of these bags laying around, they keep the yarn clean and are easy to carry. Then if I have more than one project working at the same time I just use more bags, I don’t have to cut or stuff or try to thread the hole, and knots don’t get caught. Yet I have NEVER seen anyone suggest this. So it makes me go HMMMMMMMM what is wrong with my solution? Online, I found a crochet pattern for a yarn skein bag to make it easier to keep your yarn with you on the go. It’s just a tall cylinder with handles, but it looks cool. Hi Dianne, I don’t recall how much the Red Heart skeins weight…maybe 7oz? I think they come in more than 1 size also. You can look on the label to double check when you buy them though. 2lbs is 32oz, so that would be about 4 1/2 skeins if they are 7oz each. Ohhhh I love the plastic bag idea. although I’ll have to set the plastic bag inside of another container of some sort when I’m working with wool because my cat has a wool fetish and the bag would still let her carry it off.